← Books . . . I collect old view finders, toy cameras, and mini toy t.v. view finders. So when I saw there was a collection at the UI Special Collections called “George Elmer Magic Lantern Slide Collection,” I had to find out more. After researching the topic I found out that the Magic Lantern or Lanterna Magica was an early prototype to the first slide projector. They were produced from the 17th up through the early 20th centuries, were the forerunners of slide projectors, used for visual entertainment in theaters and elsewhere. In the case of the “George Elmer” collection, they were used to supplement church sermons in Mississippi. 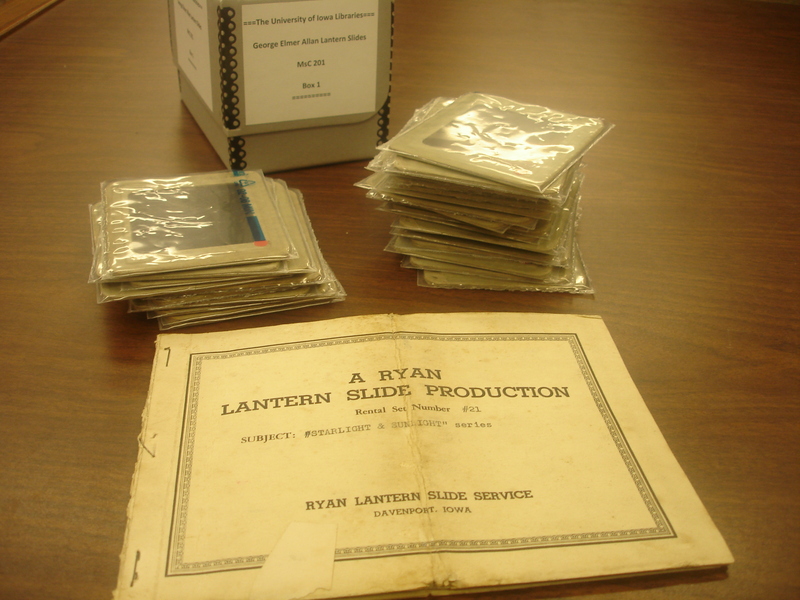 And get this, the company that sold and rented the equipment, slides, and sermon guides was out of Davenport, Iowa — the Ryan Lantern Slide Production. (UI Special Collections also has a collection devoted to the guy, Viktor Ryan, who founded the company.) Who would have guessed! The slide series I looked at the “Starlight and Sunlight” series. The sermons that went along with it “trace thru (sic.) the ages the gradual increase of the light of the knowledge of God.” I especially liked the slides of the creation, the garden of Eden, and the fall from grace. The slides look like reproductions of lithographs and are hand tinted. Unfortunately, I didn’t have a “magic lantern” to view them with, so I had to just hold them up to the light to look at them. I would have LOVED to see them projected. Supposedly there is a box of stuff in the basement of the library that old George use to carry around with him. If I ask “Sid” I might be able to see it. Here’s an image I found online –the slides I looked at weren’t as exciting as this devil projection. I love the theatricality of these magic lanterns, that they were used as part of performance. I am going to tuck away the idea of using these old-timey slides for a shadow puppet show or for an outdoor magic lantern party. What a cool idea for a collection…I still have my old viewfinder with cartoon characters from when I was little. It was my favorite toy. I love that you found this collection of Magic Lantern slides. There are just so many things in the archive that one would never expect to find…I really like your idea at the end of the blog. I want to come and see this!